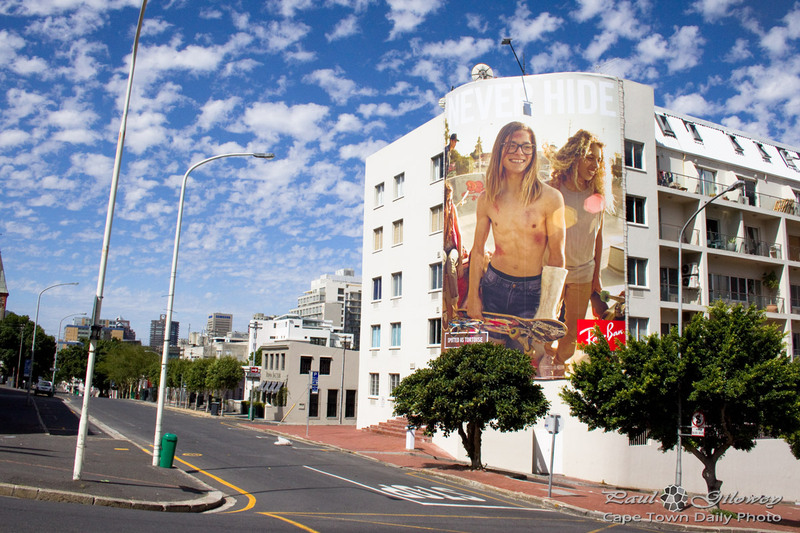 Posted in General and tagged adverts, billboards, signs, sky on Friday, 12 December, 2014 by Paul. Posted in General and tagged grass, sky, sunset, trees on Sunday, 6 April, 2014 by Paul. 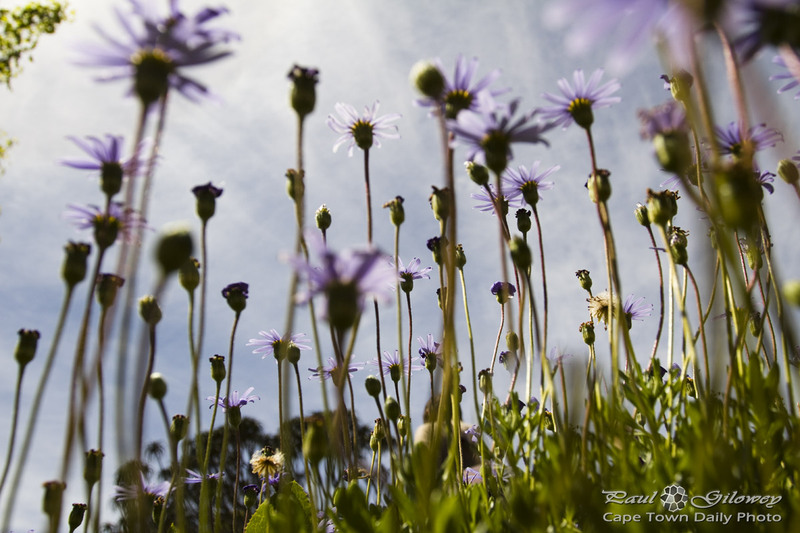 Posted in General and tagged flora, flowers, purple, sky on Tuesday, 30 October, 2012 by Paul. I recently heard of a corporate who, after 6pm, turn their building's elevators off to conserve electricity. IT unfortunately isn't a 9 to 5 job, so you can imagine how annoyed the staff must have been to learn that if they work late they have to walk the 9 flights of stairs to the ground. 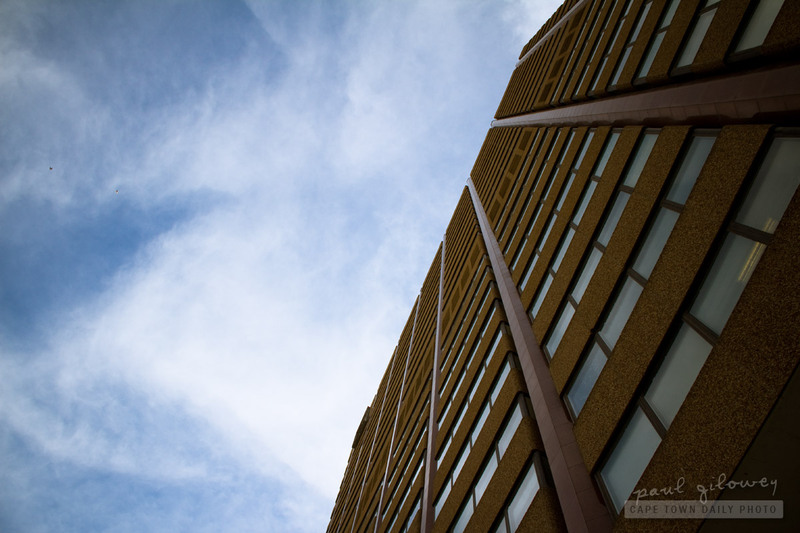 Posted in General and tagged buildings, sky on Monday, 14 November, 2011 by Paul. Sitting on the banks of the small dam at the Majik Forest (map) was one of the most tranquil moments that I'd had this whole year. The air was cool but the sun was warm, there wasn't a breath of wind and I wasn't distracted by thoughts of having to be elsewhere. It was perfect. GetSmarter, one of Cape Town's well-known online training companies have offered to give our readers 500 ZAR discount on their next Photoshop course. If you'd like to learn a little theory about digital imagery, how to colour-correct photos, how to prepare your photos for publishing, and a lot more - then consider doing GetSmarter's 10-week Photoshop course! When registering for the course use "Daily Photo" as the Promo Code and GetSmarter will reduce your course fee by 500 ZAR. 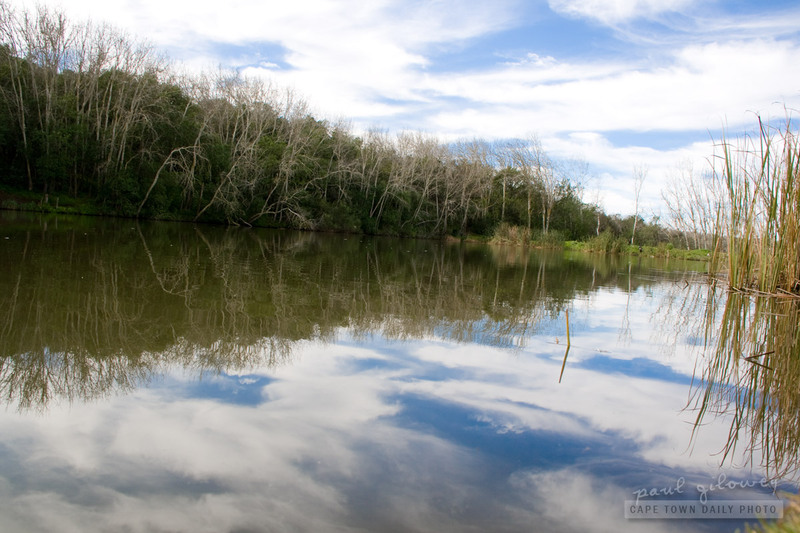 Posted in General and tagged dam, reflection, sky on Wednesday, 7 September, 2011 by Paul. 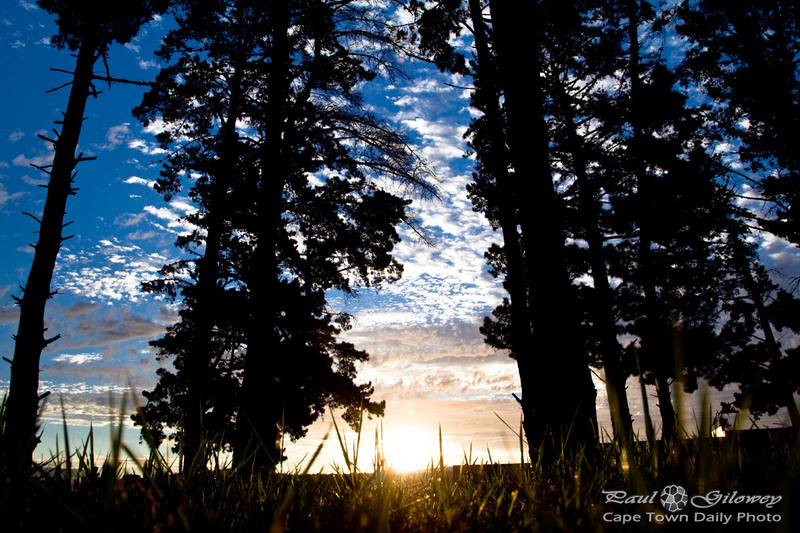 This time of the year is probably the best time to travel the Cape province's inland countryside. Around time we'll often have cool, yet bright and sunny, windless days - whereas during summer our inland countryside is terribly hot and often windy. Posted in Landscape and tagged grass, mountains, sky on Sunday, 17 July, 2011 by Paul. 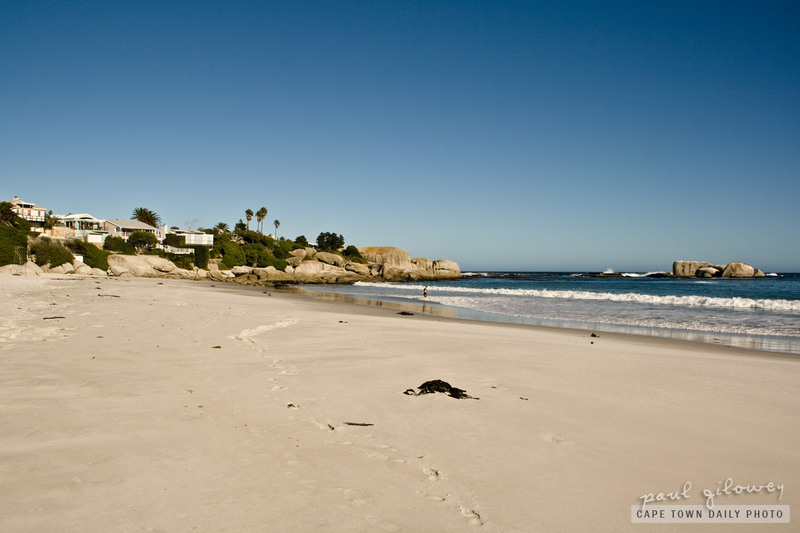 We often have beautiful clear weather in winter days, and were it not that on these days the air temperature remained at or below 20°C you'd most likely find this beach cluttered with people. Posted in General and tagged beach, blue, sea, sky on Friday, 27 May, 2011 by Paul. If you saw yesterday's photo then you'll no doubt have realised that this photo was taken from the same location. From here the beaches of Clifton, Camps Bay and Llandudno stretch into the distance from this vantage point. During summer months the roads in this area get choked with traffic and available parking spots become about as scarce as hen's teeth. I've often considered how awesome it would be to live here, but then when I get stuck in single-lane stop-start traffic on sweltering hot days - I'm not too sad that I live where the roads are wide and congestion is at a minimum. Click here to participate in my quick poll. Posted in Landscape and tagged blue, mountain, sea, sky on Thursday, 25 November, 2010 by Paul. 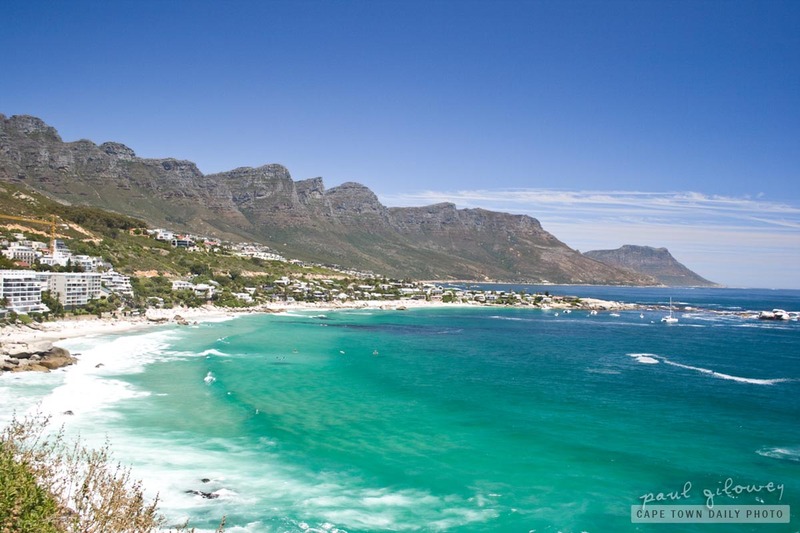 I'm sure if you've been to Cape Town before that you recognise Camps Bay beach and the Twelve Apostles mountain range in the background of this photo. 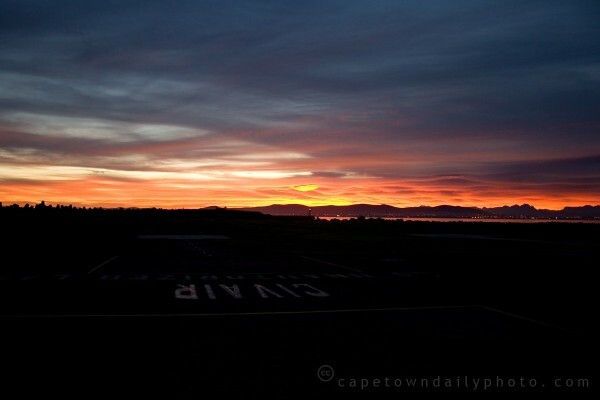 This, dear friends, is the Cape Town we live for. Blue skies, towering mountains, still air, clear water, and of course, the beauty of nature. 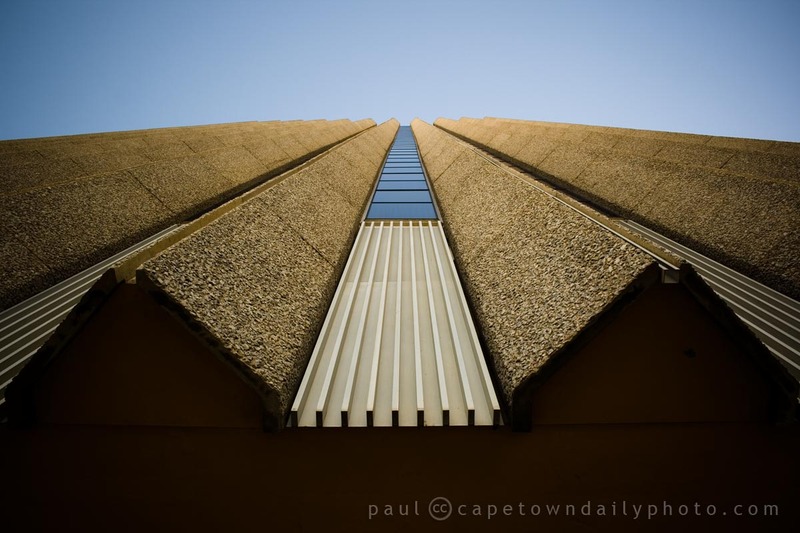 Chris and I agreed, in the comments of a previous post, that Cape Town is fantastic at this time of the year. I *hate* leaving for work in the dark and leaving the office at dusk in the winter months. These days I wake up to a brightly-lit room - and and atmosphere that shouts "get up, get out!". 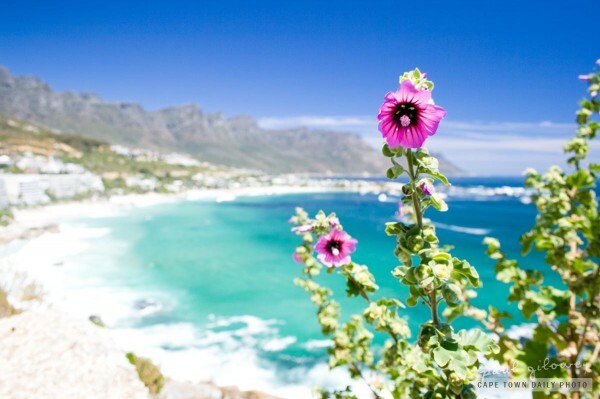 Cape Town's winters can be pretty - but OMW there's no beating summer! 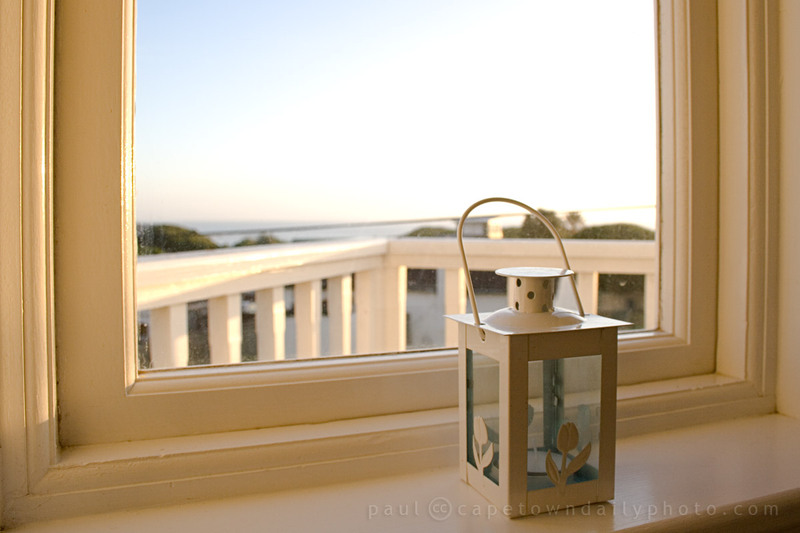 Posted in Landscape and tagged flower, sea, sky on Wednesday, 24 November, 2010 by Paul. Did I ever mention that I was moderately into cycling towards the end of high school and while I was studying? While I never actually took part in any races (it's not my thing), but my cousin and I enjoyed taking rides out towards Stellenbosch or to the Big Bay and around to Melkbos. They were fun times, and I was far fitter then than what I'm now. The irony is that it would be far better for me to be fitter now than back then, and while I've been saying it for a while now - I really have to do something about whippin' myself into shape again! 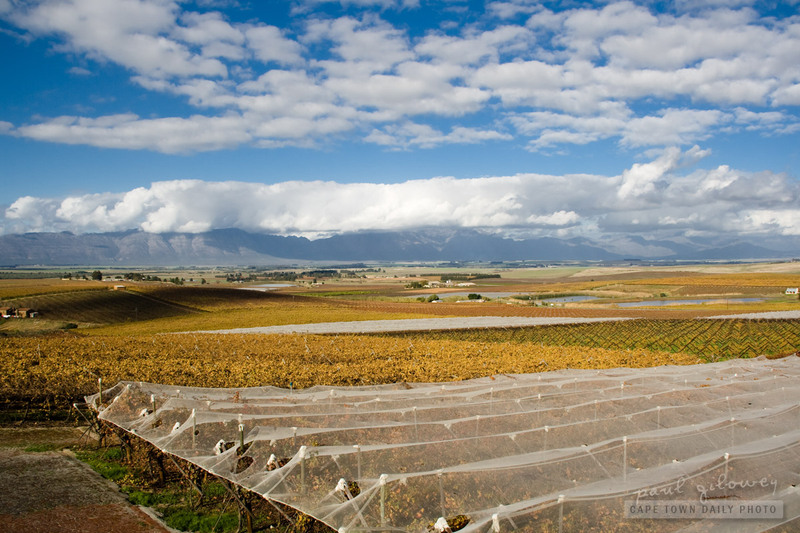 This photo was taken on Wellington Road, as it leaves suburban Durbanville and enters the farming district. 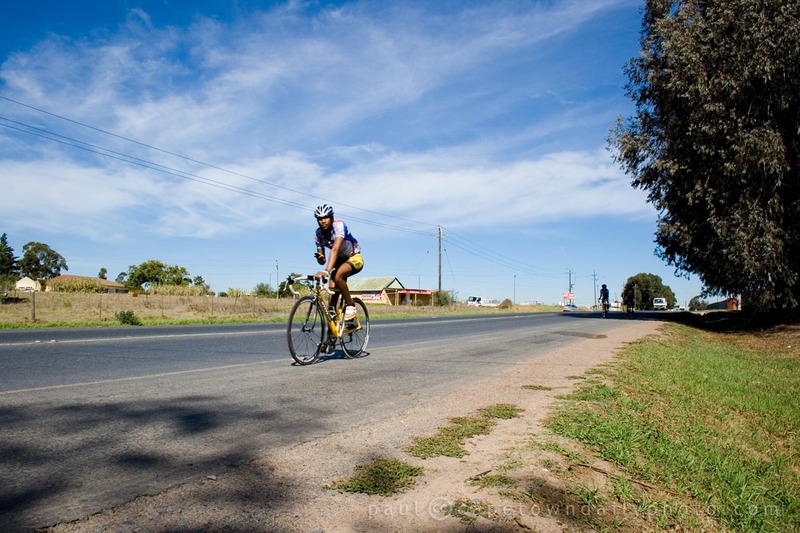 Posted in General and tagged cycling, person, sky, sport on Monday, 17 May, 2010 by Paul. This photo is a different perspective on yesterday's sunset picture. 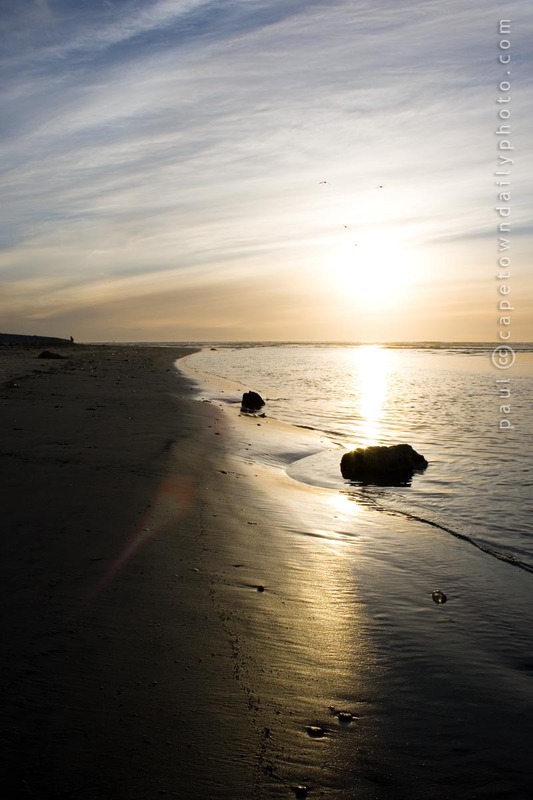 I loved the reflection of the sun's rays on the wet sand - there's something so calming and thought provoking about the reflection, the fading light, and the still ocean. Posted in Landscape and tagged beach, sand, sea, sky, sunset on Tuesday, 27 April, 2010 by Paul. As we head full-steam into 2010, and especially if you've been working far too hard, we both wish you all a year of love, laughter, and lots of lucre! 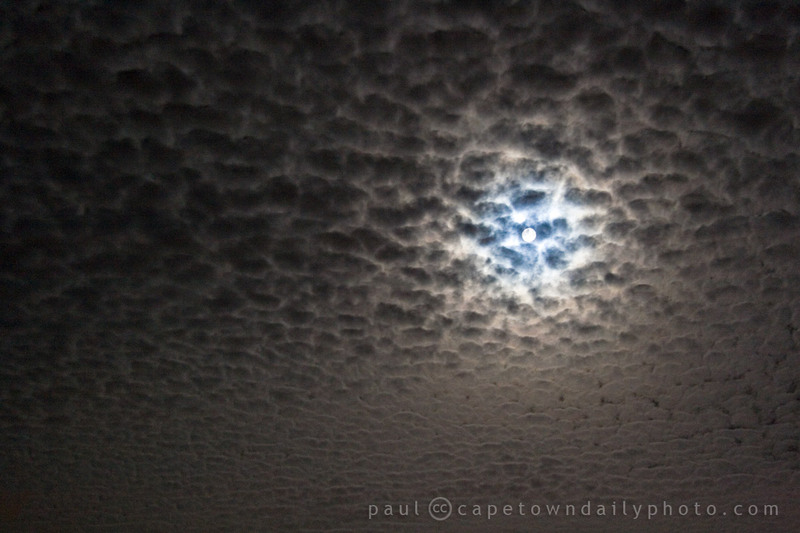 Posted in General and tagged moon, sky on Thursday, 31 December, 2009 by Paul. When I was younger I used to love doing jigsaw puzzles during the school holidays. The puzzle pictures that I liked most were the ones that evoked a sense of place. I liked pictures of city streets, or quaint alpine wooden houses with window boxes full of flowers, or horses grazing lazily in a field somewhere. I wasn't much into baskets of kittens, or underwater scenes featuring dolphins. 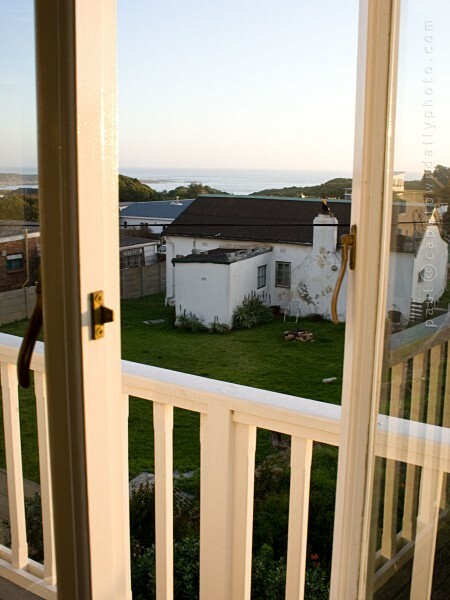 Posted in Landscape and tagged city bowl, leisure, sea, sky on Thursday, 24 December, 2009 by Kerry-Anne. Here's another visual clue to the location of our friend's house, mentioned in our previous post. Isn't this view just divine? Even though it's quite a distance to travel from here through to the city centre for meetings or social events, I can just imagine that coming home to this heavenly picture makes all that driving seem somewhat insignificant. Posted in General and tagged beach, leisure, sea, sky, sunset on Sunday, 30 August, 2009 by Kerry-Anne. Even though our gardens are still enjoying rainy days, the smell of summer is already in the air. Well, at least in my nostrils it is. Spring has already arrived - trees and shrubs are sprouting leaves, flowers are blossoming and the air is slightly warmer than it was a month ago. Summer in Cape Town is fantastic, with the only really bad part being that locals find themselves busy at work, many of them indoors, hidden away from the beauty of summer. The things that make it bearable for them (us :) ) are holidays, and the fact that summer days last until after the working day, with the sun setting after 8pm. Even when it's dark the warmth of the day lasts late into the night. You can tell I can't wait, can't you? 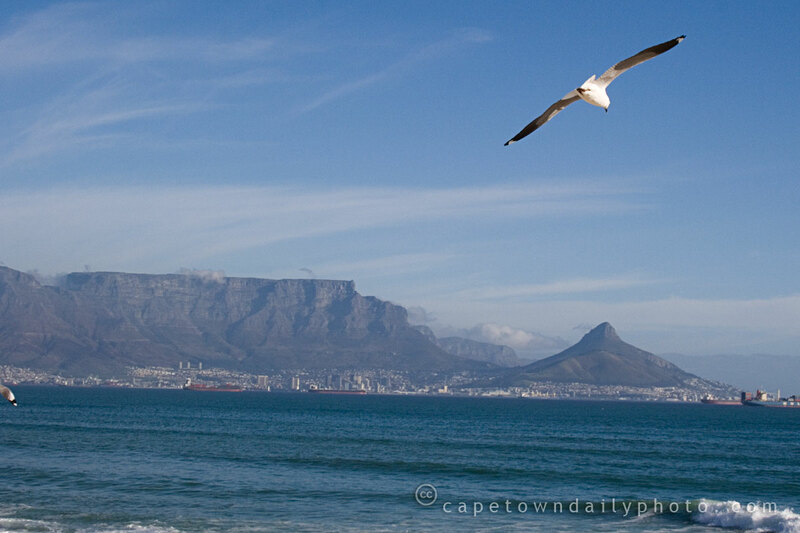 Posted in Landscape and tagged beach, sea, sky, table mountain, weather on Wednesday, 12 August, 2009 by Paul. I took this photo while walking back home after leaving the Kwikspar (mentioned in my last post). 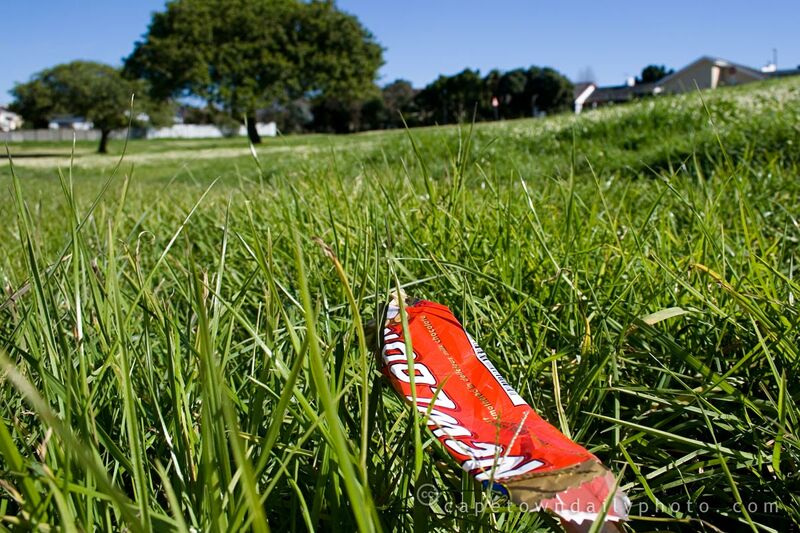 Whilst the field's not a complete litter dump, I found it annoying that every now and again I came across of a piece of careless litter like the one presented in the photo. Even as a kid I would never have dreamed of throwing my chocolate wrappers on the ground. Even if they fell by accident I'd pick them up. Even if the wind blew them beyond reach, I'd chase them down. Why is it that some think it's okay to not take care? Do you think it's that they simply don't think about what they're doing? Do you think that they believe that someone else should chase after their rubbish because they're too awesome to have to deal with it? Posted in Street photography and tagged grass, litter, sky on Sunday, 2 August, 2009 by Paul. I took this photo this morning at about 07h50, at a location just past the Table Bay Hotel at the V&A Waterfront. I overheard several people say that the sunrise this morning was the best that they'd seen in a long time, perhaps even the best ever! Today's clue in the photo above is the last one and will surely help narrow it down. In fact, I'm sure by now you have a fairly good idea of what I did this morning. Still, today's clue will help you uncover only one half of the puzzle... with the other half still represented in the second clue from yesterday's photo. Posted in General and tagged sea, sky on Wednesday, 8 July, 2009 by Paul. 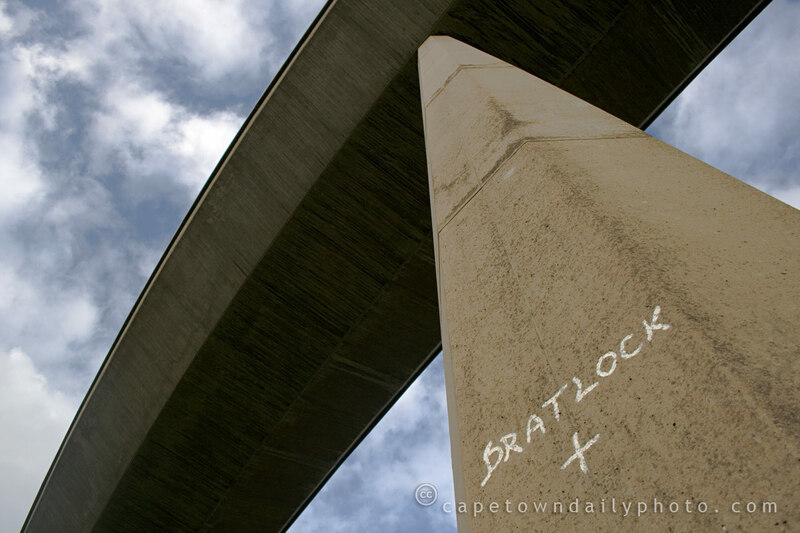 Who in the world is Dratlock? I have no idea who Dratlock is. It may not even be someone's name, nickname, or callsign. Does anybody have an idea as to who or what it is? 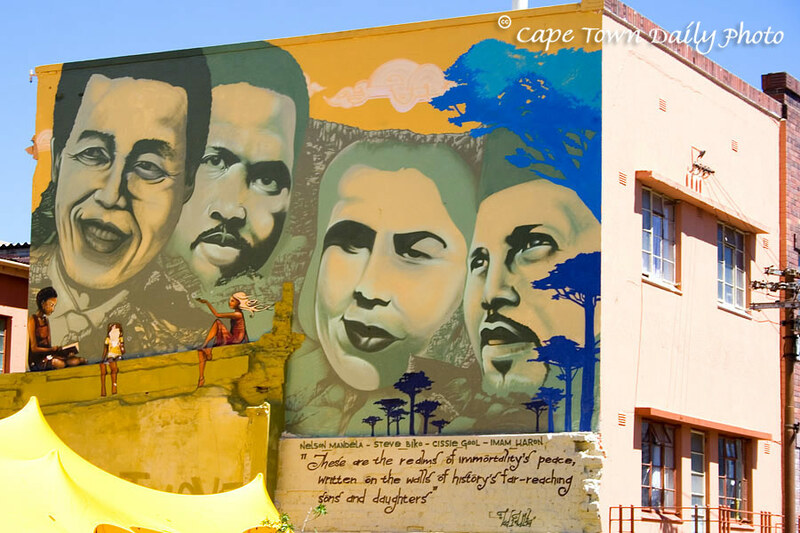 I've posted photos of graffiti in Cape Town before, mostly of mural art rather than instances of vandalism. The reality is that just like any city ours has its fair share of graffiti that is not always the most appealing or artistic type. Plenty of tax money ends up being spent on cleaning up the mess instead of on improvement projects, or benefiting the community in some way. 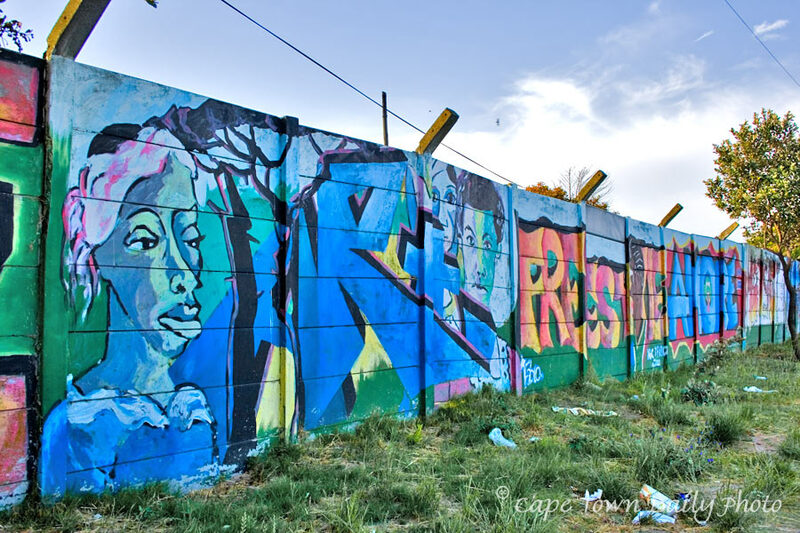 The City of Cape Town is however in the process of drafting a by-law to address graffiti. The by-law will put in place a graffiti unit that will focus on the problem and be in a position to lay civil and criminal charges against offenders. I remember years ago when we visited Sydney my nephew mentioned that kids under 18 aren't allowed to buy spraypaint at all... and in fact may not be in the possession of such unless in the presence of an adult! This law is much like the law that prevents kids in South Africa from buying cigarettes. The reality is that many kids under 18 manage to buy smokes anyway, so I don't believe limiting who may buy spraypaint would be very effective. In fact, it would have totally sucked if this law were in place in South Africa when I was younger. I remember buying loads of paint in my youth to spray everything from skateboards to science projects, and even shoes! Seriously. If you are an artist, then don't worry too much. It seems as though the by-law will cater for graffiti artists, providing areas for them to express their art... which I must say, is often just astounding. Posted in General and tagged bridge, graffiti, sky on Wednesday, 1 July, 2009 by Paul. 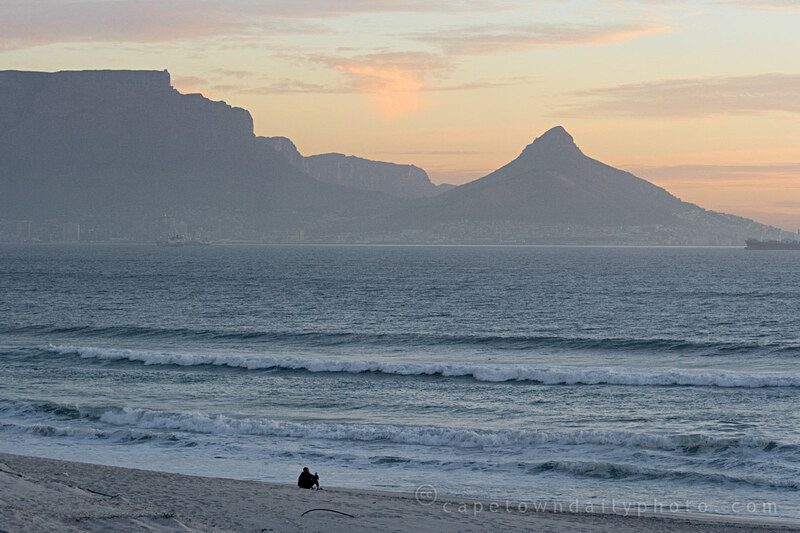 There are so many fantastic sunset spots in Cape Town: Clifton 4th Beach, Summerville in Camps Bay, Signal Hill, Table Mountain itself, Scarborough, upstairs at Wakame in Mouille Point, Blouberg Beach (which is where today's photo was taken), the top of Tygerberg Hill, Lovers' Lane... if you live in the city, or have been here, which is your favourite? And yes, I know, that's like asking you to name your favourite dessert - but give it a try anyway. Posted in Sights and tagged beach, lion's head, sea, sky, sunset on Thursday, 2 April, 2009 by Kerry-Anne. 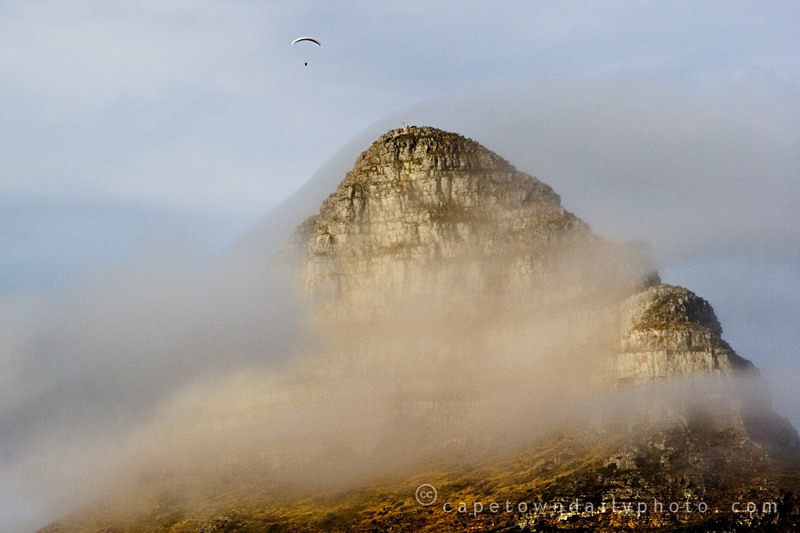 Lion's Head is a very popular launch spot for paragliders in Cape Town. That's not at all surprising, of course - can you imagine what the view must be like from up there? Actually, as it turns out, you can do more than just imagine it. 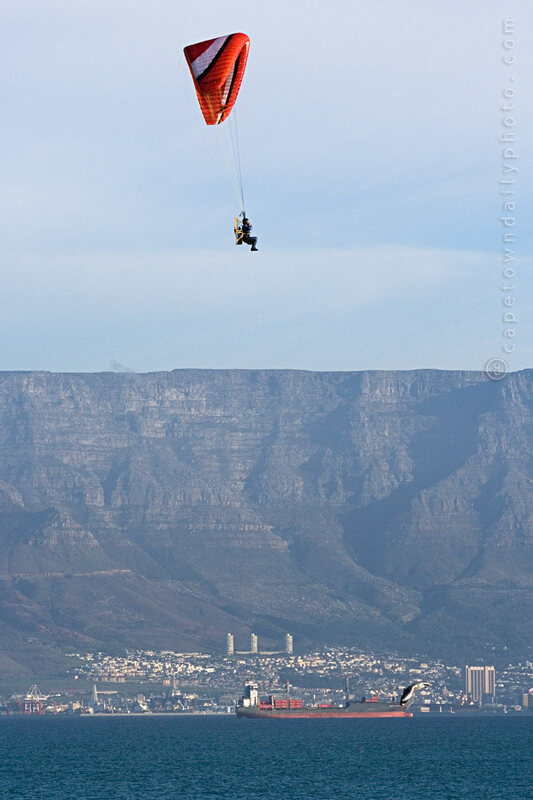 There is, in fact, a way for you to paraglide from Lion's Head without leaving your chair. This post has taken a little longer to write than it should have, because in the course of my research I discovered an awesome-beyond-words paragliding simulator on the Paragliding Earth website. And I've been paragliding all around Lion's Head for the past half an hour. 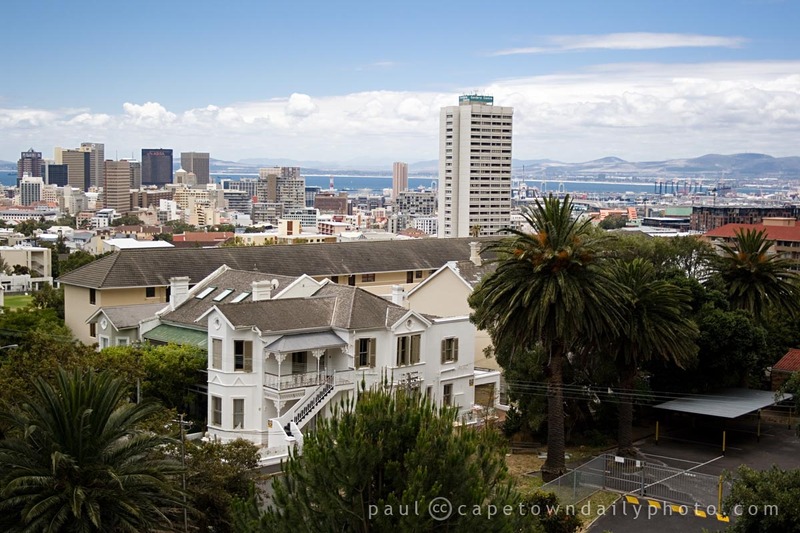 If you'd like to try it for yourself, go to the listing for Lion's Head, and click on "Fly on this site: PG simulator in GoogleEarth!". You'll need to have the Google Earth Plugin installed. 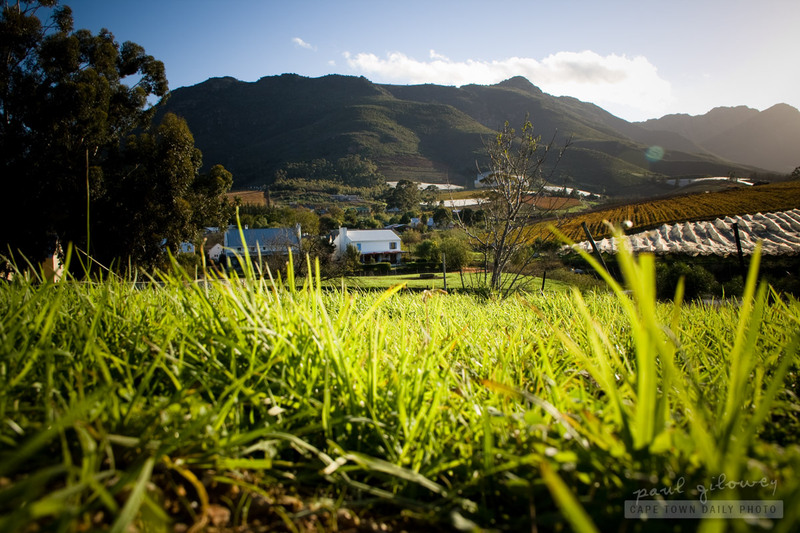 And while you wait for the landscape to load up, you can prepare for your flight by reading everything you need to know about paragliding from Lion's Head. Have fun, and happy landings! Posted in Activities and tagged leisure, lion's head, sky, sport on Friday, 27 March, 2009 by Kerry-Anne. Once every month, the moon moves in between the sun and the earth and casts a shadow; but most of the time the position of the moon's orbit relative to the earth's means that this shadow misses us entirely. This morning, however, we got to see the first solar eclipse of 2009 (and the best one that will be visible from South Africa for several years). 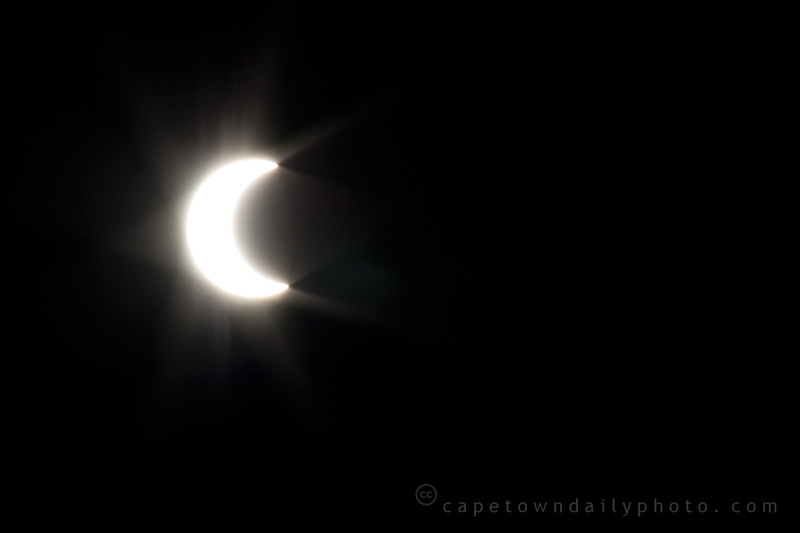 The eclipse was only partial, with a maximum coverage of about 65% visible from Cape Town just after 8am. Of course, a partial eclipse doesn't mean darkness by any means, despite what you see in the photo - the sky was actually perfectly blue, but Paul took the photo using a very high shutter speed and small aperture. Everything seemed to take on a slightly paler, softer look, though, almost as though the earth and sky were covered with gauze. Update: Take a look at Justin Hartman's awesome shot of the eclipse. I love the colours of the swirling clouds - that'd look good on a canvas, don't you think? Posted in News and tagged eclipse, sky on Monday, 26 January, 2009 by Kerry-Anne.